The seventh and penultimate season of the fantasy drama television series Game of Thrones premiered on HBO on July 16, 2017, and concluded on August 27, 2017. Unlike previous seasons that consisted of ten episodes each, the seventh season consisted of only seven. Like the previous season, it largely consisted of original content not found in George R. R. Martin's A Song of Ice and Fire series, while also incorporating material Martin revealed to showrunners about the upcoming novels in the series. [better source needed] The series was adapted for television by David Benioff and D. B. Weiss. The penultimate season focuses primarily on the convergence of the show's main plotlines in preparation for the final season. Daenerys Targaryen arrives in Westeros with her army and three dragons and wages war against the Lannisters while Jon Snow continues his efforts to find ways to defeat the Army of the Dead. He forges an alliance with Daenerys in an attempt to unite their forces against the White Walker army. The series received 22 nominations for the 70th Primetime Emmy Awards, and won for Outstanding Drama Series and Dinklage won for Outstanding Supporting Actor in a Drama Series. At the Twins, Arya, disguised as Walder Frey, poisons the remaining lords of House Frey. The White Walkers march toward the Wall, where Tollett allows Bran and Meera to enter. At Winterfell, despite Sansa's disapproval, Jon secures the loyalties of Houses Umber and Karstark, who fought alongside Ramsay in the Battle of the Bastards. At the Citadel, Samwell secretly borrows library books, one of which reveals a large deposit of dragonglass in Dragonstone, and sends word to Jon. Sam later finds Ser Jorah, now heavily infected with greyscale, quarantined in a cell. In the Riverlands, Arya meets some friendly Lannister soldiers, who consider her declared intention to kill Cersei as a joke. Thoros shows Sandor a vision of the Wall and the marching Army of the Dead in the fire. The revelation leads him to believe in the Lord of Light. In King's Landing, Jaime tells Cersei allies are crucially needed. She receives Euron, who proposes marriage in exchange for his Iron Fleet and an opportunity to kill Theon and Yara. Cersei declines, citing trust as a concern, so Euron promises to return with a "gift" to prove his loyalty. Daenerys arrives at Dragonstone, the home of House Targaryen, previously occupied by Stannis Baratheon, with her army and dragons. Daenerys sends the Dornishmen with Yara's fleet to Sunspear and the Unsullied to Casterly Rock, following Tyrion's advice to lay siege to King's Landing. She challenges Varys' loyalty and threatens to burn him alive if he ever betrays her. Melisandre arrives and encourages her to invite Jon Snow to Dragonstone. Grey Worm and Missandei consummate their relationship. Cersei summons several lords, wanting their fealties and elevating Randyll Tarly as Warden of the South. Qyburn shows Cersei a prototype ballista capable of killing dragons. Arya is reunited with Hot Pie, who tells her about Jon's ascension to King in the North. She changes her plan to travel to King's Landing, instead setting course for Winterfell. After receiving Samwell's letter, Jon travels to Dragonstone to request Daenerys' help against the White Walkers, leaving Sansa in charge at Winterfell. Jon also sternly warns Littlefinger to keep his distance from his sister. Samwell applies a forbidden treatment on Jorah's greyscale infection. Euron's fleet attacks Yara's. Obara and Nymeria are killed, while Ellaria, Tyene, and Yara are captured. Theon has flashbacks as Reek, hesitating to challenge Euron before fleeing the carnage by jumping overboard. Jon arrives at Dragonstone where Daenerys demands his fealty. He refuses and instead attempts to recruit her help in fighting the Army of the Dead. Following Tyrion's advice, Daenerys grants Jon access to the island's dragonglass. Melisandre avoids Jon and departs for Volantis. Bran, with Meera, returns to Winterfell and reveals his newfound-role as the Three-Eyed Raven to Sansa. In King's Landing, Euron presents Ellaria and Tyene as a gift for Cersei, who promises marriage after the war is won. She also awards him co-control of her military alongside Jaime. Cersei administers the same poison to Tyene that killed Myrcella, forcing Ellaria to watch her daughter's impending death and remain imprisoned with the body. In Oldtown, a healed Jorah leaves to find Daenerys. Ebrose forgives Samwell for treating Jorah but assigns him to copying endless texts as punishment. Grey Worm and the Unsullied attack Casterly Rock, only to find it mostly abandoned. It is revealed that Jaime has led the bulk of the Lannister forces in an attack on Highgarden, while Euron's fleet ambushes and destroys the Unsullied's ships. The Lannister forces quickly overwhelm Olenna's army. Jaime offers Olenna a quick and painless death by poison. After drinking it, she admits to poisoning Joffrey. Arya returns to Winterfell and reunites with Sansa. She later spars with Brienne, impressing her and unnerving Sansa with her exceptional fighting skills. Bran bids Meera an unemotional farewell as she prepares to head home, divulging he is no longer the boy she accompanied through the North. Littlefinger presents Bran with the dagger used in his attempted assassination. Bran later gives it to Arya. Cersei assures the Iron Bank a full repayment of her debt, as a wagon train carrying gold from Highgarden travels to King's Landing. In a cave filled with dragonglass, Jon reveals ancient paintings to Daenerys depicting the First Men and the Children of the Forest joining forces against the undead. Later, Daenerys learns that the Lannister forces have captured Highgarden and the attack on Casterly Rock was a diversion. Ignoring Tyrion's protests, Daenerys rides Drogon as the Dothraki cavalry launches a surprise attack on the Lannister army, decimating it and capturing its remaining forces. Drogon is wounded when Bronn fires a bolt from Qyburn's new scorpion ballista weapon, but he and Daenerys land safely. Jaime's desperate charge on horseback at a vulnerable Daenerys is thwarted by Drogon spewing fire. Bronn tackles Jaime into the river, saving him. Jaime and Bronn return to King's Landing. Daenerys offers the Lannister army survivors the choice to pledge fealty to her or die. Against Tyrion's advice, she has Drogon burn Randyll and Dickon Tarly, who refused to bend the knee. Jorah arrives at Dragonstone and reunites with Daenerys. Maester Wolkan alerts Jon and the Citadel about the wights approaching Eastwatch. Jon proposes he travel beyond the Wall to capture a wight as proof they exist and to convince Cersei to accept a temporary alliance. Davos smuggles Tyrion inside King's Landing, where he secretly meets with Jaime to propose an armistice. Cersei accepts it and also informs Jaime she is pregnant. Davos rendezvous with Gendry and returns him to Dragonstone. With the Citadel ignoring Wolkan's letter, Samwell steals several restricted books and leaves the Citadel with Gilly and Little Sam. At Winterfell, Littlefinger, knowing Arya is spying on him, lures her into finding the letter that Sansa was forced to write as a hostage in King's Landing. Jon, Jorah, and Gendry, joined by the Hound, the Brotherhood, and a group of the Free Folk led by Tormund, leave Eastwatch and pass beyond the Wall to capture a wight. At Winterfell, Littlefinger plots to isolate Sansa. Tensions between Arya and Sansa increase following Arya's discovery of the letter Sansa was forced to write, begging for Robb's fealty to Joffrey. Sansa, in turn, finds Arya's collection of faces she took from Braavos. At Dragonstone, Tyrion counsels Daenerys about the upcoming negotiations with Cersei. Beyond the Wall, Jon and the men hunt for a wight to prove the White Walkers' existence. After capturing one, the group is beset by the White Walker army. Jon sends Gendry to Eastwatch to dispatch a raven to Daenerys requesting help. During the night, an injured Thoros freezes to death. Right as the wight army is about to overwhelm Jon's party, Daenerys arrives with her dragons and rescues the men. However, the Night King, leader of the White Walkers, kills Viserion, one of Daenerys' dragons, with an ice spear. Daenerys flies off with the men, but is unable to save Jon. Benjen Stark intervenes and sacrifices himself to allow Jon to escape. When Jon and Daenerys are reunited, Jon pledges himself and the North to Daenerys as Queen. The Night King reanimates Viserion, making the dragon a part of his army. At King's Landing, the wight is presented to the Lannisters. Cersei demands Jon's neutrality in the Great War, but he upholds his oath to Daenerys, provoking Cersei to end discussions. Tyrion meets privately with Cersei, apparently gaining her alliance. Cersei later reveals to Jaime that she lied and really intends to use the Golden Company of Braavos to secure her hold on Westeros. Disgusted, Jaime deserts her and rides north. Aboard a ship bound for White Harbor, Jon and Daenerys make love. At Dragonstone, Theon earns his men's respect and leads them to rescue Yara. At Winterfell, Littlefinger sows dissent by exploiting Arya's threatening demeanor toward Sansa, leading to a trial. To his surprise, a united Sansa, Arya, and Bran accuse Littlefinger of murder, conspiracy, and treason, which Bran confirms with his visions. Deserted by the Lord of the Vale, Littlefinger is sentenced to death by Sansa and executed by Arya. Samwell arrives at Winterfell and meets with Bran, where both discuss Jon's parentage. Through Sam's earlier research and Bran's visions, they now realize Jon is a trueborn Targaryen named Aegon and the legitimate heir to the Iron Throne, as his parents — Rhaegar Targaryen and Lyanna Stark — married in secret. At Eastwatch, the Night King, astride the undead Viserion, blasts the Wall with blue dragon fire, creating a hole for the Army of the Dead to march through. The recurring actors listed here are those who appeared in season 7. They are listed by the region in which they first appear. Series creators and executive producers David Benioff and D. B. Weiss serve as showrunners for the seventh season. The directors for the seventh season are Jeremy Podeswa (episodes 1 and 7), Mark Mylod (episodes 2 and 3), Matt Shakman (episodes 4 and 5) and Alan Taylor (episode 6). This marks Taylor's return to the series after an absence since the second season. Shakman is a first-time Game of Thrones director, with the rest each having directed multiple episodes in previous seasons. Michele Clapton returned to the show as costume designer, after spending some time away from the show in the sixth season. She previously worked on the show for the first five seasons, as well as the end of the sixth season. The seventh season contains original material not found in the A Song of Ice and Fire series. [needs update] Some of the show's sixth season also consists of material revealed to the writers of the television series during discussions with Martin. The shores of Gaztelugatxe were used as a location for filming Season 7. Filming began on August 31, 2016, at Titanic Studios in Belfast, and ended in February 2017. In an interview with the showrunners, it was announced that the filming of the seventh season would be delayed until later in the year due to necessary weather conditions for filming. The showrunners stated "We're starting a bit later because, you know, at the end of this season, winter is here, and that means that sunny weather doesn't really serve our purposes any more. We kind of pushed everything down the line so we could get some grim, gray weather even in the sunnier places that we shoot." Girona, Spain did not return as one of the filming locations. Girona stood in for Braavos and parts of King's Landing. It was later announced that the seventh season would film in Northern Ireland, Spain and Iceland, with filming in Northern Ireland beginning in August 2016. The series filmed in the Spanish cities Seville, Cáceres, Almodóvar del Río, Santiponce, Zumaia and Bermeo. Spanish sources announced that the series would be filming the seventh season on Muriola Beach in Barrika, Las Atarazanas, the Royal Dockyards of Seville and at the shores of San Juan de Gaztelugatxe, an islet belonging to the city of Bermeo. The series returned to film at The Dark Hedges in Stranocum, which was previously used as the Kingsroad in the second season. Some scenes were filmed in Iceland. Filming also occurred in Dubrovnik, Croatia, which is used for location of King's Landing. The scene where Arya was reunited with Nymeria was filmed in Alberta, Canada. Deadline reported on June 21, 2016, that the five main cast members, Peter Dinklage, Nikolaj Coster-Waldau, Lena Headey, Emilia Clarke, and Kit Harington had been in contract negotiations for the final two seasons. It was reported that the cast members have increased their salary to $500,000 per episode for the seventh and eighth season. It was later reported that the actors had gone through a renegotiation, for which they had increased their salary to $1.1 million per episode for the last two seasons. On August 31, 2016, Entertainment Weekly reported that Jim Broadbent had been cast for the seventh season in a "significant" role. It was announced that the role of Dickon Tarly has been recast, with Tom Hopper replacing Freddie Stroma, who had previously played the role in "Blood of My Blood". The seventh season sees the return of Mark Gatiss as Tycho Nestoris, who did not appear in the sixth season, Ben Hawkey as Hot Pie, who last appeared in the fourth season, and Joe Dempsie as Gendry, who last appeared in the third season and maintains his status as starring cast member. Members of the British indie pop band Bastille were reported to have filmed cameo appearances. British singer-songwriter Ed Sheeran also makes a cameo appearance in the season. Frontman of American heavy metal band Mastodon, Brent Hinds, has also revealed he would have a cameo appearance. This is Hinds' second cameo in the series, following his appearance (along with bandmates Brann Dailor and Bill Kelliher) in the fifth season. New York Mets baseball pitcher Noah Syndergaard made a background cameo as a javelin-throwing Lannister soldier in "The Spoils of War." On April 21, 2016, HBO officially ordered the seventh season of Game of Thrones, just three days prior to the premiere of the show's sixth season. In a June 2016 interview with Variety, co-creators David Benioff and D. B. Weiss revealed the seventh season would likely consist of fewer episodes, stating at the time of the interview that they were "down to our final 13 episodes after this season. We're heading into the final lap." Director Jack Bender, who worked on the show's sixth season, said that the seventh season would consist of seven episodes. Benioff and Weiss stated that they were unable to produce 10 episodes in the show's usual 12 to 14 month time frame, as Weiss said "It's crossing out of a television schedule into more of a mid-range movie schedule." HBO confirmed on July 18, 2016, that the seventh season would consist of seven episodes, and would premiere later than usual in mid-2017 because of the later filming schedule. Later it was confirmed that the season would debut on July 16. The seventh season of the series includes its longest episode, with the finale running for 81 minutes. The penultimate episode also runs for 71 minutes – around 16 minutes longer than an average Game of Thrones episode. The first five episodes mostly run longer than average (55 minutes), at 59, 59, 63, 50, and 59 minutes respectively. The previous longest episode in the series was the sixth-season finale, "The Winds of Winter", which ran for 69 minutes. Ramin Djawadi returned as the composer of the show for the seventh season. On Metacritic, the season (based on the first episode) has a score of 77 out of 100 based on 12 reviews, indicating "generally favorable reviews". On Rotten Tomatoes, the seventh season has a 93% approval rating from 51 critics with an average rating of 8.22 out of 10, with the site's consensus reading, "After a year-long wait, Game of Thrones roars back with powerful storytelling and a focused interest in its central characters—particularly the female ones." The series premiere surpassed 30 million viewers across all of the network's domestic platforms weeks after its release. The show's numbers continued to climb in other countries as well. In the UK, the premiere got up to 4.7 million viewers after seven days, setting a new record for Sky Atlantic. Compared to the previous season, HBO Asia saw an increases of between 24 percent to 50 percent. HBO Latin America saw a record viewership in the region, with a 29 percent climb. In Germany, the show went up 210 percent, in Russia it climbed 40 percent and in Italy it saw a 61 percent increase. In the United States, the finale was watched by 12.1 million viewers on its first airing on television, and 16.5 million when viewings on HBO Now and HBO Go apps are included. Over the season, the viewer numbers averaged at over 30 million per episode across all platforms. ^1 Live +7 ratings were not available, so Live +3 ratings have been used instead. The season was simulcast around the world by HBO and its broadcast partners in 186 countries. In some countries, it aired the day after its first release. On July 23, 2016, a teaser production trailer was released by HBO at the 2016 San Diego Comic-Con. The trailer mostly consisted of voice overs, and shots of crew members creating sets and props. The first footage from the season was revealed in a new promotional video released by HBO highlighting its new and returning original shows for the coming year on November 28, 2016, showcasing Jon Snow, Sansa Stark and Arya Stark. On March 1, 2017, HBO and Game of Thrones teamed up with Major League Baseball (MLB) for a cross-promotional partnership. At least 19 individual teams participated in this promotion. On March 8, 2017, HBO released the first promotional poster for the season ahead of the SXSW Festival in Austin, Texas, which teases the battle of "ice vs. fire". Showrunners Benioff and Weiss also spoke at the event, along with fellow cast members Sophie Turner and Maisie Williams. On March 9, 2017, HBO hosted a live stream on the Game of Thrones Facebook page that revealed the premiere date for the seventh season as being July 16, 2017. It was accompanied by a teaser trailer. On March 30, 2017, the first official promo for the show was released, highlighting the thrones of Daenerys Targaryen, Jon Snow, and Cersei Lannister. On April 20, 2017, HBO released 15 official photos shot during the season. On May 22, 2017, HBO released several new photos from the new season. On May 23, 2017, HBO released the official posters featuring the Night King. The first official trailer for season 7 was released on May 24, 2017. The trailer set a world record for being the most viewed show trailer ever, being viewed 61 million times across digital platforms, in the first 24 hours. The second official trailer was released on June 21, 2017. The season premiere was screened at the Walt Disney Concert Hall in Los Angeles on July 12, 2017. The season was released on Blu-ray and DVD in region 1 on December 12, 2017. The season premiere was pirated 90 million times in the first three days after it aired. On August 4, 2017, it was reported that, two days before its original broadcast, the fourth episode of the season was leaked online from Star India, one of HBO's international network partners. The leaked copy has the "for internal viewing only" watermark. On July 31, 2017, due to a security breach, HBO was the victim of 1.5 terabytes of stolen data. However, "this was not related to this episode leak", according to The Verge. On August 16, 2017, four days before its intended release, it was reported that HBO Spain and HBO Nordic accidentally allowed the sixth episode of the series on-demand viewing for one hour before being removed. Data from piracy monitoring firm MUSO indicates that season seven was pirated more than one billion times mostly by unauthorized streaming, with torrent and direct downloads accounting for about 15 percent of this piracy. On average, each episode is estimated to have been pirated 140 million times, making Game of Thrones the most-pirated television series in 2017. ^ "HBO Renews Hit Series "Game of Thrones," "Silicon Valley" and "Veep" for 2017" (Press release). HBO. April 21, 2016. Archived from the original on August 16, 2017. Retrieved April 29, 2016. ^ a b Opam, Kwame (March 9, 2017). "Game of Thrones season 7 premieres on July 16th". The Verge. Archived from the original on March 9, 2017. Retrieved March 9, 2017. ^ "Shows A-Z - game of thrones on hbo". The Futon Critic. Archived from the original on August 16, 2017. Retrieved April 4, 2017. ^ a b c Hibberd, James (July 18, 2016). "Game of Thrones: HBO announces summer return, 7 episodes". Entertainment Weekly. Archived from the original on August 21, 2016. Retrieved July 18, 2016. ^ Wigler, Josh (July 12, 2018). "Emmys: A Look at All the Nominations 'Game of Thrones' Received". The Hollywood Reporter. Retrieved September 18, 2018. ^ Gonzalez, Sandra (September 18, 2018). "'Game of Thrones' reclaims best drama award at Emmy Awards". CNN. Retrieved September 18, 2018. ^ a b Porter, Rick (July 17, 2017). "Sunday cable ratings: 'Game of Thrones' scores series-best audience with Season 7 premiere". TV by the Numbers. Archived from the original on July 30, 2017. Retrieved July 18, 2017. ^ a b Porter, Rick (July 25, 2017). "Sunday cable ratings: 'Phelps vs. Shark' strong, 'Game of Thrones' boosts 'Ballers,' 'Insecure'". TV by the Numbers. Archived from the original on July 25, 2017. Retrieved July 25, 2017. ^ a b Porter, Rick (August 1, 2017). "Sunday cable ratings: 'Rick & Morty' returns strong, more highs for 'Insecure' and 'Ballers'". TV by the Numbers. Archived from the original on August 1, 2017. Retrieved August 1, 2017. ^ a b Porter, Rick (August 8, 2017). "Sunday cable ratings: 'Sharknado 5' lacks bite, 'Game of Thrones' hits total-viewer high". TV by the Numbers. Archived from the original on August 8, 2017. Retrieved August 8, 2017. ^ a b Porter, Rick (August 15, 2017). "Sunday cable ratings: 'Game of Thrones' scores another series high". TV by the Numbers. Archived from the original on August 15, 2017. Retrieved August 15, 2017. ^ a b Porter, Rick (August 22, 2017). "Sunday cable ratings: 'Survivor's Remorse' premiere steady, 'Game of Thrones' down a little". TV by the Numbers. Archived from the original on August 22, 2017. Retrieved August 22, 2017. ^ a b Porter, Rick (August 29, 2017). "Sunday cable ratings: VMAs hit all-time low opposite 'Game of Thrones' finale". TV by the Numbers. Archived from the original on August 29, 2017. Retrieved August 29, 2017. ^ a b c d e f g h i j k l m n o p q r s t u v w x y z "Emmy(R)- and Golden Globe-Winning HBO Series "Game of Thrones" Returns for Seventh Season July 16" (Press release). HBO. July 7, 2017. Retrieved July 8, 2017. ^ Rodman, Sarah (July 12, 2017). "Gendry's back! The lost son of King Baratheon will return during the 7th season of 'Game of Thrones'". Los Angeles Times. Archived from the original on July 15, 2017. Retrieved July 15, 2017. ^ Kain, Erik (April 21, 2017). "New 'Game Of Thrones' Photos Hint At Season 7 Clues". Forbes. Archived from the original on August 2, 2017. Retrieved July 8, 2017. ^ "Game of Thrones star is delighted to be back at Castle Black". The Shield Gazette. October 15, 2016. Archived from the original on October 18, 2016. Retrieved October 15, 2016. ^ a b c Bryant, Jacob (April 20, 2017). "'Game of Thrones' Season 7: First Photos". Variety. Archived from the original on July 5, 2017. Retrieved July 8, 2017. ^ Cain, Dan (September 27, 2017). "PICTURE EXCLUSIVE: Game Of Thrones cast film battle scenes for new series in Northern Ireland... a day after scooping 12 awards at the Emmys". The Daily Mail. Archived from the original on April 2, 2017. Retrieved September 30, 2016. ^ "#WinterIsComing #Belfast #Irishthrones Just a casual walk amongst the green fields of Corbet and i bump into these people!!". Twitter. September 28, 2016. Archived from the original on December 2, 2017. Retrieved September 30, 2016. ^ "Megan Parkinson CV". Independent Talent. June 22, 2017. Archived from the original on August 2, 2017. Retrieved June 22, 2017. ^ Pearson, Ben (June 13, 2017). "New 'Game of Thrones' Season 7 Photos and Special Effects Featurette". /Film. Retrieved July 7, 2017. ^ "#watchersOTthewall #Irishthrones #Belfast These are a few more sightings of many!! Care to work out what the plot might be hehe??". Twitter. October 3, 2016. Archived from the original on February 3, 2017. Retrieved October 5, 2016. ^ "@IrishThrones @WatchersOTWall @magnificentMR @GameOfThrones More pics for your theories!!". Twitter. October 12, 2016. Archived from the original on January 15, 2017. Retrieved October 13, 2016. ^ a b Evans, Greg (June 21, 2017). "New Game Of Thrones Season 7 Trailer: 'Fight Every Battle!'". Deadline Hollywood. Archived from the original on June 21, 2017. Retrieved June 21, 2017. ^ a b Wigler, Josh (May 24, 2017). "'Game of Thrones' Season 7 Trailer: "The Great War is Here"". The Hollywood Reporter. Archived from the original on May 24, 2017. Retrieved May 24, 2017. ^ Collins, Sean T. (May 24, 2017). "'Game of Thrones' Season 7: Everything We Know So Far". Rolling Stone. Archived from the original on June 23, 2017. Retrieved July 8, 2017. ^ a b Hooton, Christopher (November 18, 2016). "Game of Thrones season 7 spoilers: Tom Hopper lands recast role". The Independent. Archived from the original on November 19, 2016. Retrieved November 19, 2016. ^ a b Busis, Hillary (April 10, 2017). "Game of Thrones: Expect to See a Lot More of Braavos in Season 7". Vanity Fair. Archived from the original on April 12, 2017. Retrieved April 10, 2017. ^ a b Hibberd, James (August 31, 2016). "Game of Thrones casts Jim Broadbent in first season 7 role". Entertainment Weekly. Archived from the original on September 1, 2016. Retrieved August 31, 2016. ^ Collin, Robbie (April 10, 2017). "Jim Broadbent on Game of Thrones, public school, and his 'arrogant, pompous' Sense Of An Ending role'". Telegraph.co.uk. Archived from the original on April 10, 2017. Retrieved April 10, 2017. ^ Vineyard, Jennifer (July 6, 2016). "Game of Thrones' Gemma Whelan on Yara's Sexuality and Freezing on Set". Vulture. Archived from the original on September 9, 2016. Retrieved September 12, 2016. ^ Hibberd, James (June 27, 2017). "Game of Thrones: Jessica Henwick's Sandsnake almost vanished from show". Entertainment Weekly. Archived from the original on July 9, 2017. Retrieved July 8, 2017. ^ Kurp, Josh (December 15, 2016). "Everyone's Least Favorite 'Game Of Thrones' Characters Are Returning In Season 7". Uproxx. Archived from the original on August 2, 2017. Retrieved July 8, 2017. ^ a b Hibberd, James (June 29, 2016). "Game of Thrones season 7 directors revealed". Entertainment Weekly. Archived from the original on August 21, 2016. Retrieved June 29, 2016. ^ Robinson, Joanna (June 27, 2016). "What We Can Expect from Game of Thrones Season 7". Vanity Fair. Archived from the original on June 28, 2016. Retrieved June 27, 2016. ^ Noble, Matt (August 18, 2015). "'Game of Thrones' director Jeremy Podeswa dishes Jon Snow death, teases season six (Exclusive Video)". GoldDerby. Archived from the original on April 3, 2016. Retrieved August 21, 2015. ^ Smith, Oliver (September 23, 2016). "The incredible locations that will star in Game of Thrones season 7". Telegraph. London. Archived from the original on January 2, 2017. Retrieved January 1, 2017. ^ a b Ausiello, Michael (July 18, 2016). "Game of Thrones Season 7 Premiere Pushed to Summer 2017". TVLine. Archived from the original on July 19, 2016. Retrieved July 18, 2016. ^ Li, Shirley (July 22, 2016). "Game of Thrones team on season 7, who should be on Iron Throne". Entertainment Weekly. Archived from the original on July 23, 2016. Retrieved July 25, 2016. ^ Riefe, Jordan (February 27, 2017). "'Game of Thrones' Parodies Proliferate as Filming Wraps on Season 7". The Hollywood Reporter. Archived from the original on February 28, 2017. Retrieved February 28, 2017. ^ Swift, Andy (July 6, 2016). "Game of Thrones Season 7 Production Delayed". TVLine. Archived from the original on July 7, 2016. Retrieved July 6, 2016. ^ a b Trivedi, Sachin (June 10, 2016). "'Game of Thrones' Season 7: Braavos may not be featured; Multiple battles near castles". International Business Times. Archived from the original on June 17, 2016. Retrieved June 27, 2016. ^ "EMMY®- AND GOLDEN GLOBE-WINNING HBO SERIES GAME OF THRONES TO BEGIN PRODUCTION ON SEASON SEVEN THIS SUMMER" (Press release). HBO. July 18, 2016. Archived from the original on August 21, 2016. Retrieved July 18, 2016. ^ "ZUMAIA Y ZONA NORTE:". Facebook. August 31, 2016. Archived from the original on August 19, 2017. Retrieved September 9, 2016. ^ "Las Atarazanas será escenario del rodaje de la séptima temporada de 'Juego de Tronos'". El Correoweb. September 6, 2016. Archived from the original on August 16, 2017. Retrieved September 8, 2016. ^ "'Juego de Tronos' grabará en Trujillo el 18 de noviembre". Hoy.es. August 20, 2016. Archived from the original on September 2, 2016. Retrieved September 8, 2016. ^ "We have had confirmation that The Dark Hedges at Stranocum in Ireland will be used for #GameOfThrones Season 7 filming this week #KingsRoad". Twitter. October 11, 2016. Archived from the original on August 19, 2017. Retrieved October 13, 2016. ^ Goldberg, Lesley (July 18, 2016). "'Game of Thrones Season 7". Hollywood Reporter. Los Angeles. Archived from the original on December 21, 2016. Retrieved December 19, 2016. ^ "EXCLUSIVE – Game of Thrones is back in Dubrovnik". The Dubrovnik Times. December 14, 2016. Archived from the original on July 2, 2017. Retrieved July 17, 2017. ^ Mertz, Emily (February 27, 2017). "'Game of Thrones' was in Banff to film some scenes with wolves". Global News. Archived from the original on August 7, 2017. Retrieved August 7, 2017. ^ Andreeva, Nellie (June 21, 2016). "'Game Of Thrones' Stars Set For Potential Season 8 On HBO With Big Raises". Deadline Hollywood. Archived from the original on June 25, 2016. Retrieved June 27, 2016. ^ Robinson, Joanna (June 21, 2016). "Game of Thrones: Are These Characters "Safe" After Renewing Contracts Through Season 8?". Vanity Fair. Archived from the original on June 25, 2016. Retrieved June 28, 2016. ^ Goldberg, Lesley (November 17, 2016). "Robert De Niro's Making How Much?! TV Is Becoming an ATM for Top Talent". The Hollywood Reporter. Archived from the original on January 14, 2017. Retrieved January 22, 2017. ^ Hooton, Christopher (January 23, 2017). "Game of Thrones season 7: Bastille 'film cameo in battle sequence'". The Independent. Archived from the original on January 25, 2017. Retrieved January 23, 2017. ^ Huff, Lauren (March 12, 2017). "Ed Sheeran to Appear in 'Game of Thrones' Season 7". The Hollywood Reporter. Archived from the original on March 13, 2017. Retrieved March 12, 2017. ^ Toney, Jordan (March 14, 2017). "Mastodon's Brent Hinds is returning back to 'Game of Thrones'". Alternative Press. Archived from the original on March 15, 2017. Retrieved March 15, 2017. ^ Hoffman, Benjamin (August 7, 2017). "Noah Syndergaard's 'Game of Thrones' Cameo Ends in Fiery Death". New York Times. Retrieved July 18, 2018. ^ Swift, Andy (April 21, 2016). "Game of Thrones Renewed for Season 7". TVLine. Archived from the original on June 26, 2016. Retrieved June 27, 2016. ^ a b Birnbaum, Debra (April 14, 2016). "'Game of Thrones' Creators Mull Shorter Final Seasons (EXCLUSIVE)". Variety. Archived from the original on August 21, 2016. Retrieved June 27, 2016. ^ Robinson, Joanna (June 1, 2016). "Game of Thrones Director Jack Bender Talks Direwolf Deaths, Lost, and Holding That Door". Vanity Fair. Archived from the original on June 23, 2016. Retrieved June 27, 2016. ^ Van Boom, Daniel (June 8, 2017). "'Game of Thrones' season 7 finale will be pretty damn long". CNET. Archived from the original on June 10, 2017. Retrieved June 10, 2017. ^ a b Hibberd, James (June 8, 2017). "'Game of Thrones' Season 7 Will Have the Show's Longest Episode Ever". Entertainment Weekly. Archived from the original on June 9, 2017. Retrieved June 10, 2017. ^ Tassi, Paul (June 9, 2017). "HBO's 'Game of Thrones' Season 7 Finale Is Practically Movie-Length". Forbes. Archived from the original on June 9, 2017. Retrieved June 10, 2017. ^ Bradley, Bill (January 26, 2017). "'Game Of Thrones' Composer Says You're Not Hearing What You Think You Are". The Huffington Post. Archived from the original on January 26, 2017. Retrieved January 26, 2017. ^ "Game of Thrones - Season 7 Reviews". Metacritic. CBS Interactive. Archived from the original on July 22, 2017. Retrieved July 18, 2017. ^ a b "Game of Thrones: Season 7". Rotten Tomatoes. Fandango. Archived from the original on April 30, 2016. Retrieved June 9, 2018. ^ a b Hibberd, James (August 2, 2017). "Game of Thrones boom: Ratings hit 30 million viewers". Entertainment Weekly. Archived from the original on August 2, 2017. Retrieved August 2, 2017. ^ Koblin, John (August 28, 2017). "'Game of Thrones' Finale Sets Ratings Record". New York Times. Archived from the original on September 7, 2017. ^ Porter, Rick (July 26, 2017). "'Game of Thrones,' 'Nashville' and 'Orphan Black' lead the cable Live +7 ratings for July 10–16". TV by the Numbers. Archived from the original on July 27, 2017. Retrieved July 26, 2017. ^ Porter, Rick (August 3, 2017). "'Game of Thrones,' 'Descendants 2' make big gains in cable Live +7 ratings for July 17–23". TV by the Numbers. Archived from the original on August 4, 2017. Retrieved August 3, 2017. ^ Porter, Rick (August 5, 2017). "'Game of Thrones' rules the cable Live +3 ratings for July 24–30". TV by the Numbers. Archived from the original on August 7, 2017. Retrieved August 7, 2017. ^ Porter, Rick (August 17, 2017). "'The Sinner' premiere triples in cable Live +7 ratings for July 31-Aug. 6". TV by the Numbers. Archived from the original on August 18, 2017. Retrieved August 21, 2017. ^ Porter, Rick (August 24, 2017). "'Nashville,' 'Orphan Black' finales score in cable Live +7 ratings for Aug. 7-13". TV by the Numbers. Archived from the original on August 25, 2017. Retrieved August 24, 2017. ^ Porter, Rick (August 30, 2017). "'The Sinner' makes more strong gains in cable Live +7 ratings for Aug. 14-20". TV by the Numbers. Archived from the original on August 31, 2017. Retrieved August 31, 2017. ^ Porter, Rick (September 7, 2017). "'Game of Thrones' finale reaches all-time highs: Cable Live +7 ratings for Aug. 21-27". TV by the Numbers. Archived from the original on September 8, 2017. Retrieved September 7, 2017. ^ "AFI AWARDS 2017". American Film Institute. 2017. Retrieved January 11, 2018. ^ Tapley, Kristopher (January 9, 2018). "'Blade Runner,' 'Mudbound,' 'Game of Thrones' Land ASC Cinematography Nominations". Variety. Retrieved January 9, 2018. ^ "Best of 2017". IGN. 2017. Retrieved January 11, 2018. ^ Holloway, Daniel (January 10, 2018). "'Game of Thrones,' 'Black-ish' Top Humanitas Prize Finalists". Variety. Retrieved January 11, 2018. ^ Giardina, Carolyn (November 16, 2017). "HPA Awards: 'Dunkirk' Wins Best Editing in a Feature". The Hollywood Reporter. Retrieved February 14, 2018. ^ "2017 NOMINEES". International Press Academy. Retrieved February 12, 2018. ^ Lewis, Rebecca (January 23, 2018). "National Television Awards 2018 winners". Metro. Retrieved February 15, 2018. ^ Swift, Andy (December 6, 2017). "Critics' Choice Awards 2018: Netflix, FX's FEUD Lead TV Nominations". TVLine. Retrieved December 16, 2017. ^ Rubin, Rebecca (December 11, 2017). "Golden Globe Nominations: Complete List". Variety. Retrieved December 16, 2017. ^ Rubin, Rebecca (December 11, 2017). "SAG Award Nominations: Complete List". Variety. Retrieved December 16, 2017. ^ Sheehan, Paul (January 28, 2018). "2018 Grammys: Full list of winners at the 60th Grammy Awards [UPDATING LIVE]". GoldDerby. Retrieved January 28, 2018. ^ Giardina, Carolyn (January 26, 2018). "Best Edited Drama Series for Non-Commercial Television - Eddie Awards: 'Dunkirk,' 'I, Tonya' Top American Cinema Editors' Honors". The Hollywood Reporter. Retrieved January 28, 2018. ^ Hipes, Patrick (December 4, 2017). "Annie Awards: Disney/Pixar's 'Coco' Tops Nominations". Deadline Hollywood. Retrieved December 4, 2017. ^ Grobar, Matt; Petski, Denise (January 27, 2018). "ADG Awards: 'The Shape Of Water', 'Blade Runner 2049', 'Logan' & 'Coco' Take Film Trophies — Complete Winners List". Deadline Hollywood. Retrieved January 28, 2018. ^ Giardina, Carolyn (February 24, 2018). "Cinema Audio Society Awards: Sound Mixers Hear 'Dunkirk'". The Hollywood Reporter. Retrieved February 24, 2018. ^ Brockington, Ariana (February 21, 2018). "'I, Tonya,' 'The Shape of Water' Win at 2018 Costume Designers Guild Awards". Variety. Retrieved February 21, 2018. ^ "DGA Announces Nominees for Outstanding Directorial Achievement in Television, Commercials and Documentary for 2017". Directors Guild of America. January 10, 2018. Retrieved January 11, 2018. ^ Giardina, Carolyn (February 24, 2018). "'Darkest Hour' Tops Makeup Artists and Hair Stylists Guild Awards". The Hollywood Reporter. Retrieved February 25, 2018. ^ Dupre, Elyse (January 5, 2018). "2018 Producers Guild Award Nominations: The Full List of Film and TV Nominees". E! News. Retrieved January 5, 2018. ^ Littleton, Cynthia (December 7, 2017). "Writers Guild Award TV Nominations: 'The Americans,' 'Handmaid's Tale,' 'GLOW' Grab Multiple Mentions". Variety. Retrieved January 11, 2018. ^ "Ifta Awards 2018: the full list of nominations". The Irish Times. January 11, 2018. Retrieved February 14, 2018. ^ "IFTAs: Full list of winners as Gabriel Byrne is honoured with Lifetime Achievement Award". Irish Independent. February 16, 2018. Retrieved February 16, 2018. ^ Caranicas, Peter (April 7, 2018). "'Dunkirk,' 'Baby Driver' Score Motion Picture Wins at LMGI Awards". Variety. Retrieved April 8, 2018. ^ "'The Crown' Battles It Out With 'Black Mirror' & 'Line Of Duty' As BAFTA TV Nominations Are Unveiled". Deadline Hollywood. April 4, 2018. Retrieved April 5, 2018. ^ "BAFTA TV Craft Award Winners Include 'Game Of Thrones' & 'The Crown'". Deadline Hollywood. April 22, 2018. Retrieved April 22, 2018. ^ "Webby Awards: 'Game Of Thrones', Lin-Manuel Miranda, Lady Gaga Among Winners". Deadline Hollywood. April 24, 2018. Retrieved April 24, 2018. ^ Ramos, Dino-Ray (May 3, 2017). "MTV Movie & TV Awards: 'Black Panther', 'Stranger Things' Lead Pack In Nominations". Deadline Hollywood. Retrieved May 3, 2018. ^ Mitovich, Matt Webb (September 17, 2018). "Emmys: Mrs. Maisel, Versace, Barry and Game of Thrones Among Big Winners". TVLine. Retrieved September 18, 2018. ^ Sanchez, Omar (September 8, 2018). "Creative Arts Emmys: Winners List So Far". The Hollywood Reporter. Retrieved September 9, 2018. ^ Setaro, Shawn (July 23, 2016). "'Game of Thrones' Drops Season 7 Teaser". Complex. Archived from the original on July 26, 2016. Retrieved July 23, 2016. ^ Roots, Kiberley (November 28, 2016). "Game of Thrones: Does First Season 7 Footage Hint at Stark Reunion?". TVLine. Archived from the original on November 29, 2016. Retrieved November 28, 2016. ^ Vincent, Alice (November 28, 2016). "Starks back on form as Game of Thrones season 7 teaser trailer airs". The Daily Telegraph. London, England. Archived from the original on December 2, 2016. Retrieved December 19, 2016. ^ Lieberman, David (March 1, 2017). "'Game Of Thrones' Teams With Major League Baseball For Cross Promotions". Deadline Hollywood. Archived from the original on March 2, 2017. Retrieved March 1, 2017. ^ Hibberd, James (March 8, 2017). "Game of Thrones season 7 first poster teases ice vs. fire". Entertainment Weekly. Archived from the original on March 9, 2017. Retrieved March 9, 2017. ^ Roots, Kimberly (March 30, 2017). "Game of Thrones: Watch the Haunting First Season 7 Teaser Trailer Now". TVLine. Archived from the original on March 31, 2017. Retrieved March 30, 2017. ^ Hibberd, James (April 20, 2017). "Game of Thrones first season 7 photos". Entertainment Weekly. Archived from the original on April 21, 2017. Retrieved April 20, 2017. ^ Hibberd, James (May 22, 2017). "Game of Thrones unleashes epic season 7 dragon war photo". Entertainment Weekly. Archived from the original on May 25, 2017. Retrieved May 22, 2017. ^ Roots, Kimberly (May 23, 2017). "Game of Thrones Season 7: The Night King Is Coming in Eerie New Poster". TVLine. Archived from the original on May 23, 2017. Retrieved May 23, 2017. ^ Petski, Denise (May 25, 2017). "'Game Of Thrones' Season 7 Trailer Snags 61 Million Views In First 24 Hours, HBO Says". Deadline Hollywood. Archived from the original on May 25, 2017. Retrieved May 25, 2017. ^ Wigler, Josh (July 13, 2017). "Inside the 'Game of Thrones' Season 7 Premiere as HBO Brings Winter to Downtown L.A." The Hollywood Reporter. Archived from the original on July 13, 2017. Retrieved July 13, 2017. 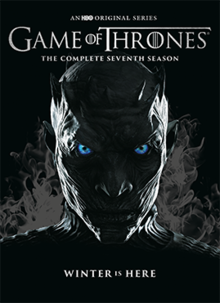 ^ "Game of Thrones - 'The Complete 7th Season' Already Planned for DVD and Blu-ray Disc". TVShowsOnDVD. Archived from the original on July 26, 2017. Retrieved July 26, 2017. ^ Dornnush, Jonathon (September 14, 2017). "Game of Thrones: Season 7 Blu-Ray, DVD, Digital Download Release Dates, Bonus Features Announced". IGN. Archived from the original on September 14, 2017. Retrieved September 14, 2017. ^ Price, Rob (July 21, 2017). "The 'Game of Thrones' season 7 premiere was pirated a staggering 90 million times". Business Insider. Archived from the original on July 30, 2017. Retrieved July 21, 2017. ^ Hibberd, James (August 4, 2017). "Game of Thrones episode 4 leaks online". Entertainment Weekly. Archived from the original on August 5, 2017. Retrieved August 4, 2017. ^ Plaugic, Lizzie (July 31, 2017). "Game of Thrones script and other HBO episodes reportedly leak online following hack". The Verge. Archived from the original on August 5, 2017. Retrieved August 5, 2017. ^ Warren, Tom (August 4, 2017). "Latest Game of Thrones episode leaks online before TV broadcast". The Verge. Archived from the original on August 4, 2017. Retrieved August 4, 2017. ^ Hooton, Christopher (August 16, 2017). "HBO has accidentally broadcast this week's Game of Thrones". The Independent. Archived from the original on August 16, 2017. Retrieved August 16, 2017. ^ Ernesto (September 5, 2017). "Game of Thrones Season 7 Pirated Over a Billion Times". TorrentFreak. Archived from the original on September 6, 2017. Retrieved September 6, 2017. ^ Van der Sar, Ernesto (December 26, 2017). "'Game of Thrones' Most Torrented TV-Show of 2017". TorrentFreak. Retrieved December 27, 2017.